The common persimmon, Diospyros virginiana, is a large deciduous tree in the Ebenaceae, or Ebony family. It grows to a height of sixty, and some have been recorded at eighty. It can have a singular trunk or multiple trunks. It tends to form colonies. 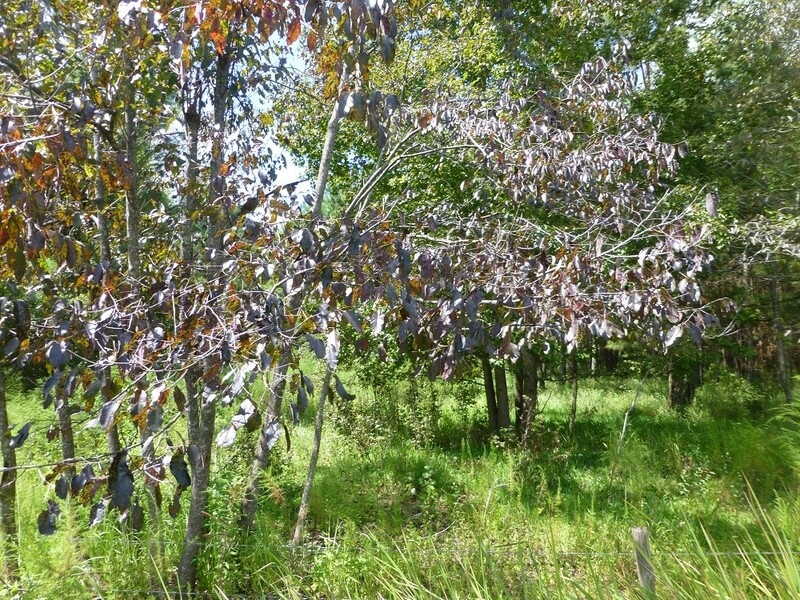 Persimmon grows in a variety of habitats. 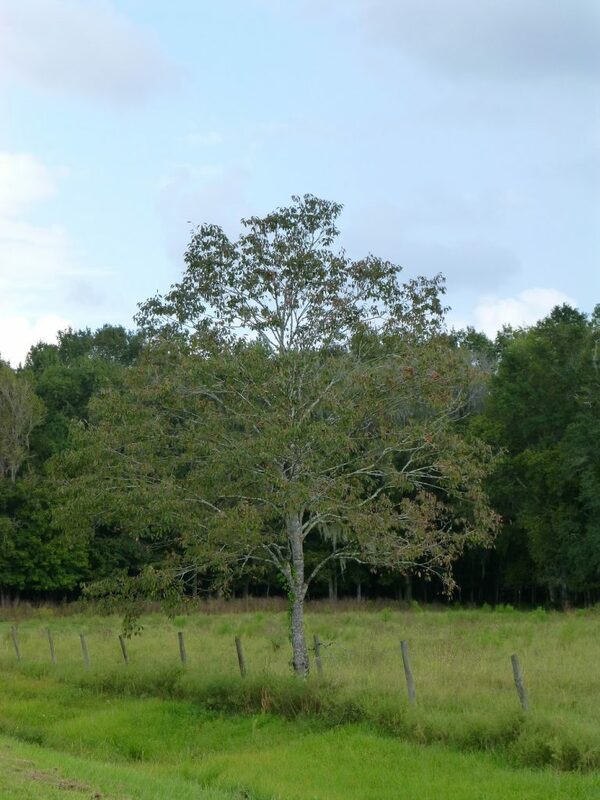 It can be found growing in rich bottom woodlands, upland hammocks, pine flatwoods, old fields and fence rows. Its leaves are alternate, and ovate-oblong to elliptic in shape. The margins are smooth. Leaves can be from four to six inches in length and up to three inches wide. The bark is a very dark grayish black. The older bark forms chunks or blocks that give it a checker board look. In the fall when the fruit starts to ripen the leaves turn beautiful shades of orange and burgundy before they begin to fall. 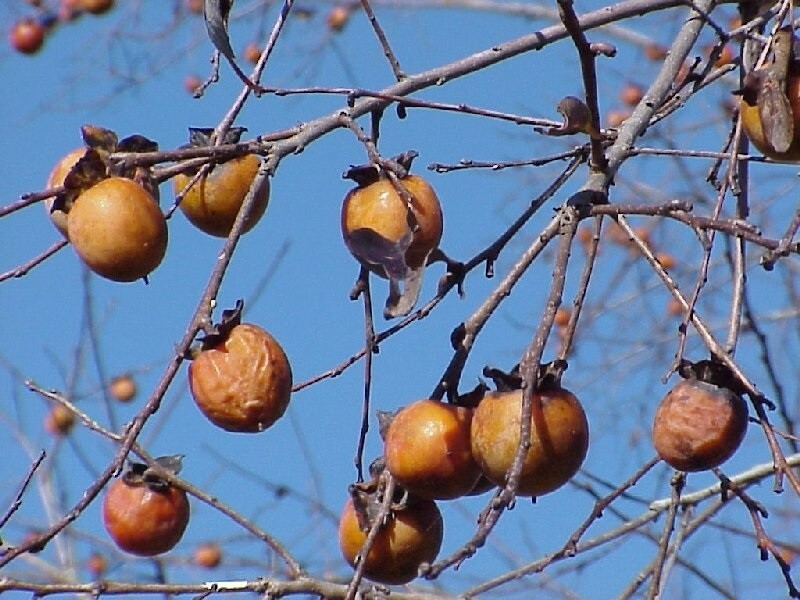 American persimmon has male and female flowers on separate trees, which means it is dioecious. Female flowers are about half an inch wide while the male flowers are only three sixteenths of an inch in width. The flowers are greenish yellow and bell shaped with recurved lobes. The flowers are thick and fleshy. The flowers are a favored nectar source for bees. The persimmon fruit is round and orange to reddish purple in color. Fruit size is generally 1 ¼ inches across. Some trees have fruit that will ripen and become soft during the fall without the benefit of a frost. In my area of Central Florida I collect fruit from many trees in September long before we even experience our first cold spells. Some tree’s fruits will not soften until the first frosts of January and February. It depends upon the individual tree. Persimmon fruit is hard and astringent when unripe. Collecting ripe fruit has to be done over a period of time as the fruit ripens, which can be as long as a month. Checking for freshly fallen fruit is an easy way of collection. If the tree is small enough, or individual limbs can be reached, shaking the tree is another easy collection method. The fruit is soft and sticky and very delicious, but it has to be separated from its skin and seeds before using in recipes. The fruit contains many large seeds so a food mill or potato ricer is quite helpful in separating the pulp from the seeds and skin. It can be used to make many recipes such as pies, jams, cakes, cookies, waffles, pudding, ice cream, and fruit leather. The prepared pulp freezes well for later use. The fruit are prized by wildlife. Persimmon fruit is a very important food source for songbirds, turkey, and small and large mammals. In winter persimmon is a precious food source when little else is available. Here in Central Florida the wildlife have access to the ripening fruit from September to November. “Persimmon provided … resources in the nineteenth century. 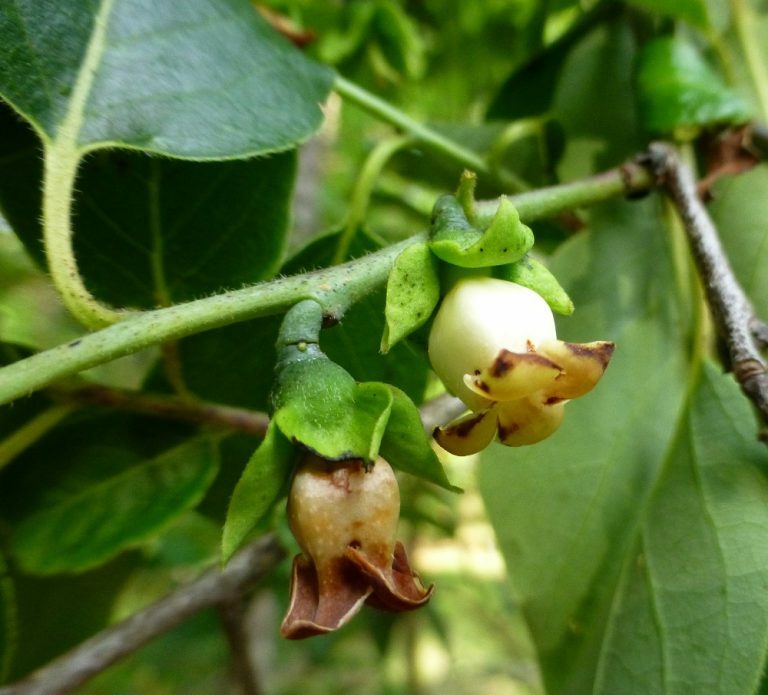 Both fruit and bark were used … to treat fevers, sore throats, diarrhea, dysentery …. Civil War doctors of the South … recommended syrup made from uripe … fruits … as an easily used preventative for dysentery in camps. 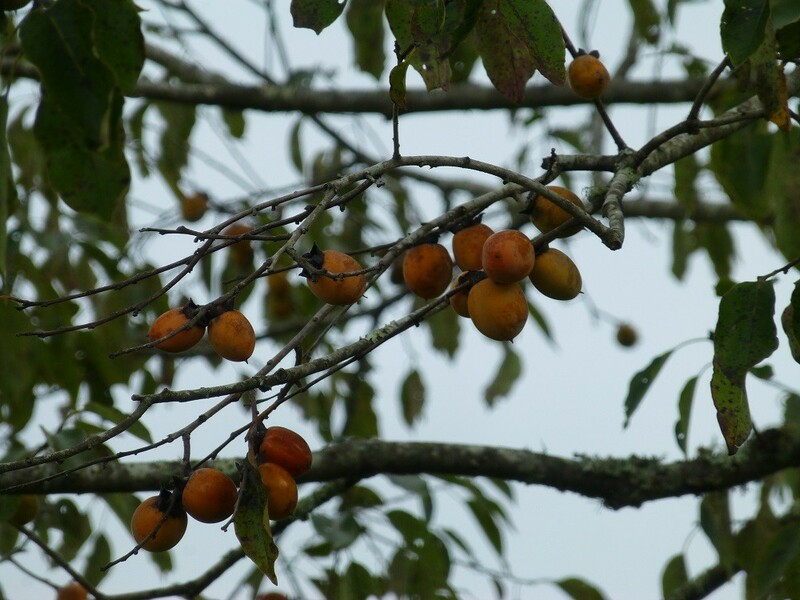 Apart from medicinal uses, immature persimmons mashed and boiled in water, provided a basis for an indelible ink and black dye … the juice also served as a tanning agent for leather. In the home landscape persimmon should be planted in part shade to full sun with average soil and moisture. It does not do well in moist conditions. It is native to the following states: AL, AR, CT, DC, DE, FL, GA, IA, IL, IN, KS, KY, LA, MA, MD, MO, MS, NC, NE, NJ, NY, OH, OK, PA, SC, TN, TX, UT, VA, and WV. It grows in zones 5a to 9b. 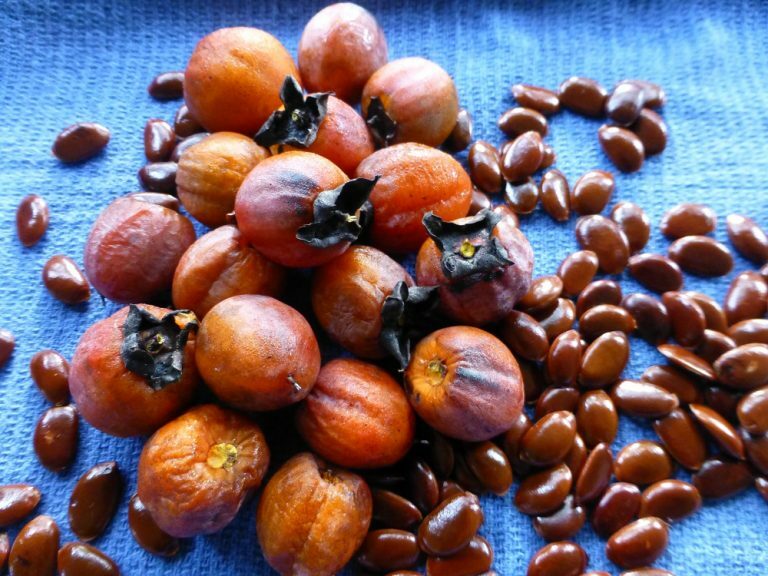 Persimmon seeds should be soaked for a few days before planting unless they have been stored in refrigeration. Replace the water each day with fresh, warm, water. Propagation by hardwood cuttings is also an option, but mature wood of at least two years is needed. Also, transplanting seedlings that volunteer is another option. However, they do not fare well if their roots are disturbed so it is best to transplant to your growing site rather than in a garden pot. Peterson, Lee, and Roger Tory Peterson. A Field Guide to Edible Wild Plants of Eastern and Central North America. Boston: Houghton Mifflin, 1978. Foster, Steven, and James A. Duke. A Field Guide to Medicinal Plants: Eastern and Central North America. Boston: Houghton Mifflin, 1990. Turner, Matt Warnock. Remarkable Plants of Texas Uncommon Accounts of Our Common Natives. Austin, Tex. : U of Texas, 2009.